Benjamin Adler Algreen is an innovative thinker with an analytical mindset, self-taught programmer in multiple languages, and an MSc. in International Business and Politics. At Ruta N, he lead the open data strategy for the Mayor’s office and Metropolitan Area, generating the city’s first sources of open data through high-impact public-private partnerships and citizen engagement. Medellín is a city with a dark past and a bright future. In just 20 years it went from murder capital to most innovative city in the world, and yet it feels like the city is only just beginning to reach its true potential. An indescribable feeling hangs in the air of a city that is exploding into the future, and when asked, it is often difficult to put into words what makes Medellín such a wonderful place. It is busy, modern, diverse, and functional, and people from all over the world are living and working here as nomadic freelancers, entrepreneurs, and volunteers. There is a real sense of excitement in the air. But with that excitement for growth and innovation comes a new set of urban challenges including a worsening air pollution problem, the need for better transportation options, and a growing income divide. Solving these challenges can be complicated, and it is not always as easy as simply creating a solution or replicating an idea that has been implemented elsewhere. Often, there simply isn’t enough data to understand the problem or determine if a solution will be viable in the long run. For example, many new participants in the growing economy don’t have enough (or any) financial data for banks to offer them financial services. This is a huge cost on the economy, both in the sense that it removes an entire demographic of demand for the banks, and prevents a portion of the population from being to invest, build credit, and make major purchases like homes and cars. What kind of data is required, then? How will it be collected? Who is ultimately responsible for generating this data? To answer these kinds of questions requires a whole new approach to data-driven decision making in a city where IOT and smart city infrastructure is still a young development. Ruta N is a public innovation hub dedicated to developing new opportunities and city solutions in science, technology, and innovation. In 2016, Steven Adler worked with Ruta N to create a data strategy for the city focused on forming an ecosystem of public-private partnerships and transparent data sharing. I arrived at Ruta N in early 2017 to launch this strategy. The first step was to build the capacity needed for the city government to begin openly publishing their data. This isn’t as easy as it sounds. Internally, each department of the city government has different data reporting standards and formats, there was no joint database to store the data, and communicating change was difficult (to say the least) because IT staff often had little decision-making power and decision makers often had little IT expertise. In 2017 we integrated three departments into the open data strategy: Planning, Mobility, and Security, and by the end of 2018 we will have integrated three more. The next step was to create a data inventory and begin prioritizing which data sets to publish first. This was accomplished by creating a data governance board with a representative responsible for each department’s data. Most data needs to be cleaned (made more usable) and anonymized before it can be shared to the public, requiring time and resources. Finally, we worked with an international DKAN development team called Angry Cactus to develop the most advanced open data portal I’ve ever seen, including built-in business intelligence tools and statistical analytics. Implementing this strategy in the public sector was always going to be a difficult challenge. 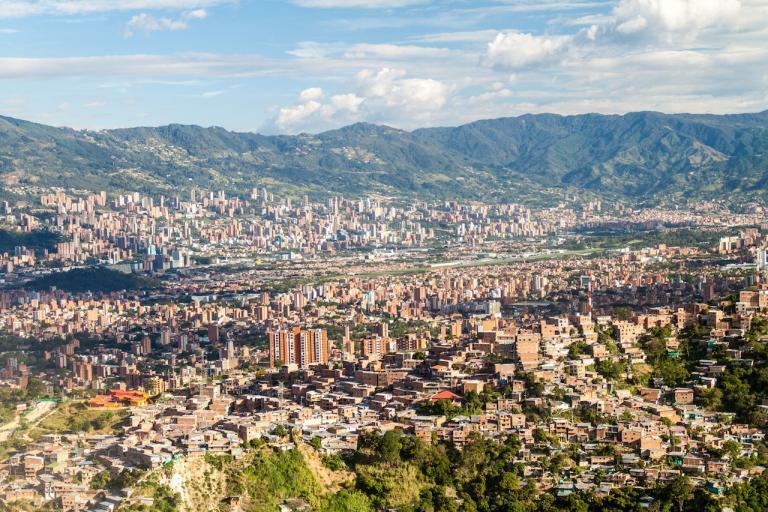 Bureaucracy, small budgets, and understaffed departments are an unavoidable symptom of city government no matter where you are in the world, and Medellín is no exception. Additionally, open data initiatives are often assumed to be IT projects exclusively, but the reality is that technological processes are easier to change than human processes are. A great example of this is how the city government prioritized budget allocations. In fact, the budget for 2017 was almost exclusively spent on two strategic elements: teaching citizens and government employees about data, and developing an open data portal. These are undoubtedly important points, but the mistake here is that essentially no budget was allocated to producing, capturing, and publishing open data. Open data was treated as an IT project in which a technological infrastructure was needed, and people had to be taught how to use it, with the result being that when the data portal was successfully launched in March of 2018, there was no data available to populate it. In hindsight, the most important work of 2017 was to help the city government understand that ultimately technology is just a tool we use to achieve our goals. The fact of the matter is that no matter how ambitious the city government is to become a data-driven leader, it is going to take time. So how do we move forward, faster? Collaboration. Medellín is special in that established local companies, NGOs, startups, students, and private citizens are all extremely dedicated to making their city a better place. It is part of the reason the city has been able to make so much social progress in such a short period of time. Thus, the Consejo de Datos Medellín (The Data Council Medellín) was born. Made up of representatives from the public sector, the city’s largest companies like Bancolombia and Sura, universities like UPB and EAFIT, startups, civic tech groups, and engaged citizens, the Consejo is a forum for open dialog about the city’s challenges, as well as a launching pad for data-driven projects that wouldn’t be possible without collaboration and input from all its members. At the beginning of 2017, when air pollution was at crisis levels and people had to work from home for a week, we launched a project to install PM2.5 pollution sensors throughout the city that publish real-time open data. This was also an opportunity to engage people who don’t necessarily know a lot about the air pollution problem or what the data might mean. We designed a pilot to host a series of workshops in libraries, community centers, and schools in disadvantaged neighborhoods, where everyday people were taught about open data, how the sensors work, and what the data means for our health and daily lives. This created a sense of ownership within the community, and made the data accessible to people who might not otherwise have known it existed. It was a truly collaborative initiative. Everyone participated. The pilot was led by an NGO called MAKAIA, private companies like IBM funded it, the city government helped develop the workshops, startups provided the sensors and technological support, libraries and schools provided locations, and citizens from the ages of 9 to 90 learned, asked questions, and got involved in something they had never done before. This air pollution pilot was just an example of how successful these collaborative projects can be. Today, 10 sensors have been installed throughout the city by a variety of companies and institutions, publishing data 24/7 at intervals of once every 30 seconds. However, it was only a pilot, and if the city is to truly progress it needs to focus on driving impact and scaling these incredible ideas into incredible realities. Collaboration and a common sense of progress is what makes Medellín such an incredible place, and it is the reason it has become one of the most innovative cities in the world, but the city will inevitably continue to face new growing pains as an emerging city. To remain innovative in the future will require a lot of work. Students and professionals need to be empowered with data skills and capacities, local institutions are required to make it easier for international talent, companies, and ideas to get involved, and a greater emphasis has to be placed on long-term solutions that are driven and measured by data. Innovation is never fixed, and what is considered innovative today will not be considered innovative tomorrow.